HONIARA, Solomon Islands – Pacific Partnership 2013 concluded the Solomon Islands phase of the mission, Aug. 13. The Royal New Zealand Navy ship HMNZS Canterbury completed the final phase of this year’s mission after spending 16 days supporting engineering and medical projects through out the Solomon Islands. The amphibious dock landing ship USS Pearl Harbor (LSD 52) and the dry cargo and ammunition ship USNS Matthew Perry (T-AKE 9) departed the mission Aug. 7 after supporting the mission for eight days. While in Solomon Islands, Pacific Partnership held 15 disaster response events, 12 engineering projects, 11 medical and dental engagements, four veterinary engagements, 26 subject matter expert exchanges and 10 community service events on eight different islands spanning up to approximately 200 miles apart. 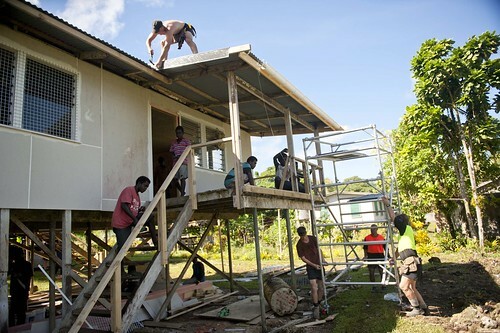 Pacific Partnership engineers often worked alongside local residents, sometimes the residents were students of engineering but often they were people looking to lend a hand. Lovely added that emotion was high with everyone involved as projects got closer to completion and people could see the fruits of their labor coming together. HMNZS Canterbury stood as the flagship for Pacific Partnership in the mission’s final phase. Members of the crew said it was a unique opportunity to improve the infrastructure of the Solomon Islands.